The T-80 is a Rank II Soviet light tank with a battle rating of 2.0 (AB) and 2.3 (RB/SB). It was introduced in during the Closed Beta Test for Ground Forces before Update 1.41. An upgrade over the T-70, the T-80 introduces better armour and an extra crew member to increase the tank's survivability in the battlefield. Just like the previous T-70, the T-80 boasts strong frontal armour and high mobility in a compact package. However, several notable upgrades are present. These upgrades include an increased crew count, fire rate, and cannon traverse range. The only downsides are that turret armour is reduced, and a somewhat large shot trap now exists all around the turret. Suspension wheels are 10 mm thick while tracks are 15 mm thick. Ammo racks of the T-70 (identical to T-80). The T-80 is a little different from most light tanks. Like all light tanks, it has excellent speed and mobility. 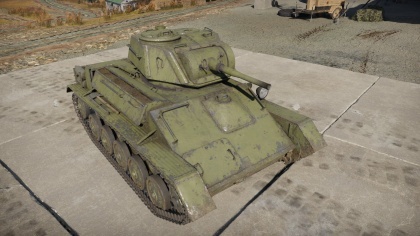 Unlike most light tanks it has great, sloped frontal armour and good turret armour, making it highly resistant to most tier 1 gun. Pair this with its fast firing 45mm gun and it becomes an excellent vehicle for hunting lightly armoured foes. The addition of APCR allows you to fight more heavily armoured vehicles. You may come across Matilda and Valentine tanks, which are highly resistant to the APHEBC round but can be more easily penetrated by the APCR (at the expense of less damage). In order to take full advantage of this tank's strengths, you should aim to use one of two distinct tactical options. Option one is to operate as a frontline tank in urban combat. Your frontal armour is of great use here. However, this strategy should be avoided if you are not near or at the top of this tank's matchmaking range. The other option is to work as a flanking tank. Your gun is more than capable in this role, and unlike most flanking role tanks, the surprise isn't always necessary for survival. Thanks to your strong frontal armour, you can do well under incoming fire if your attempt at flanking is discovered, or if your opponent is determined to survive and providing stiff resistance. Few tanks offer the level of flexibility in terms of combat approach that is granted to the T-80. When taking the tank into battle, a mix of APHEBC and APCR is favourable. The BR-240 AP shells against flanked opponents and structural weaknesses (e.g. Pz.4 E turret), while the BR-240P APCR role is for close range combat (<400m, due blunt nose cone) and engaging heavy armoured box tanks, especially the M3 Lee, StuG and up-armoured T-28E. As usual, having a few rounds of pure HE is great against any SPAAG. In battle, you must beware of some of the high calibre guns found at the tier. Tank Destroyers such as the Panzerjäger I, 75mm Gun Motor Carriage M3 and the Japanese Ho-Ni will all be able to take the T-80 out easily. SPGs armed with howitzer type guns like the Type 4 Ho-Ro also pose a high threat. Also, beware German vehicles armed with the long barreled 50mm gun, like the Panzer III J and Sd.Kfz. 234/2 Puma. The best way to play the T-80 is to use it as a light tank. Do not be overconfident. Avoid direct combat and assume that enemy tanks will be able to penetrate you. Attacking from an advantageous position will allow your tanks great armour and gun to shine. The T-80 is damaged very easily, and, as such, having the "parts" modification should be the first priority. After that, researching AP and APCR rounds is very useful, since it allows the tanker to be much more of a threat to well-armoured opponents, being much more versatile. 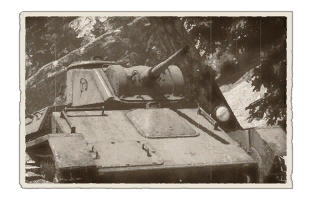 Some guns will really struggle to penetrate your armour at this tier. Japanese 37/57mm and other 45mm guns (without APCR) pose very little threat. Often underestimated. Many players will aim poorly and their shells will ricochet. Ability to scout in low rank. Gun is inaccurate at long range. Tank wobbles when you stop, meaning you will have to wait a few seconds before you can fire accurately. Easily one-shotted due to the crew number. The T-80 light tank was a redesign of the T-70 light tank in an attempt to make the design relevant again. During World War II, the concept of the light tank was deemed obsolete, they were too lightly armoured, too lightly armed, and sometimes don't go that much faster than the 1940s medium tank designs which had better armour and guns. Plus, the smaller profile of the tank meant that the crew are not necessarily given enough comfort room and the constraint would force turret design to be a one or two-man turret, restricting the commander to perform other duties as well. 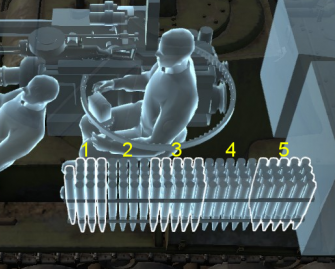 The T-80 tried to remedy this by giving the tank more armour and a two-man turret so the commander could coordinate more efficiently than the one-man turret on the T-70. However, the role of the light tank in Soviet Union could be fulfilled by the incoming supplies of Lend-Lease equipment available from Britain and America in the form of M3 Stuarts and Valentine tanks, which are better than the T-70 and T-80 designs. In October of 1943, the light tank production were all cancelled, resulting in only 120 T-80s being produced in its brief production life. Skins and camouflages for the T-80 from live.warthunder.com. This page was last edited on 10 February 2019, at 23:53.